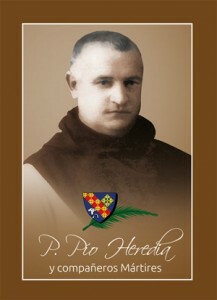 Angelo Cardinal Amato, SDB, prefect of the Congregation for the Causes of Saints presented to Pope Francis a degree regarding the martyrdom of the Servants of God Pio Heredia and 17 Companions, monks and nuns of the Cistercian Order of the Strict Observance (Trappists) and of the Congregation of San Bernard. The designation of martyr means that a determination was made that they were killed in hatred of the faith during the Spanish Civil War (1936-1939). The beatification is Saturday, October 3, 2015 in the cathedral of Santander, Cantabria, Spain. The Cistercians consider the martyrdom of their brothers as a testimony to the Sermon on the Mount where our Lord, “Blessed are the peacemakers, for they shall be called sons of God.” Their death is a great witness “To prefer nothing to the love of Christ.” And, they did so in silence. Brother Leandro Gómez Gil, 21 years.